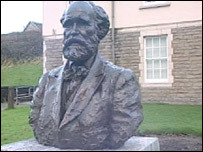 A memorial to the founder of the modern Labour Party, Keir Hardie, has been unveiled in his former constituency in the south Wales valleys. The unveiling of the bronze bust in Aberdare marks the centenary of the party's birth. Hardie, Merthyr and Aberdare MP from 1900, was joined in Parliament in 1906 by 28 Labour Representation Committee members, founding modern Labour. A bust of Hardie was unveiled by Cynon Valley MP Ann Clwyd. 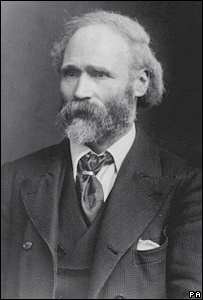 Born in Lanarkshire, Hardie was an organiser of early trade unions in the coal mines of his native Scotland before being elected MP for West Ham in east London in 1892. In 1900, he organised a meeting of various trade unions and socialist groups which formed the Labour Representation Committee, later to become the Labour Party. Hardie served as MP for Merthyr and Aberdare from his election in 1900 until his death in 1915. A century on from Labour's foundation, a bronze bust of Hardie was unveiled in his former constituency by its current MP, Ann Clwyd. She said: "I am enormously proud both to be the MP for the constituency Keir Hardie represented and to be the current chair of the Parliamentary Labour Party. "It is important that we have a lasting reminder of the contribution that Keir Hardie made to this area and to working people throughout the country." The bronze bust is a copy of one at the House of Commons, with the stone plinth on which the bust sits made from Indian granite, donated by the Indian government. Among the guests at the unveiling were two ministers from the Indian High Commission, recognising Hardie's championing of the cause of Indian independence. Kenneth O Morgan, who wrote a 1967 biography of Hardie, said the Labour leader had long-standing links with pre-independence India. He said: "They [the links] mainly stemmed from a visit he made in 1907. He went round the world when he was the first chairman of the Labour Party. "He went to India and made a sensation. It was the first time that a prominent English politician had gone to India, taken part in demonstrations and meetings and suggested, amazingly, that India might be governed by the Indians. "He was a very liberal, humanitarian man with a very strong social ethic. He supported votes for women and international peace. "Most of what he suggested has become the common coin. "As regards India, he simply thought it was a matter of injustice that Indians had very little opportunity to govern themselves." Lord Morgan said Hardie's views on India had made him an unpopular figure back in Britain. He added: "He wrote a little book on his visit which appeared in 1909 - India Impressions and Suggestions. "It's a very powerful text and it shocked many people, including King Edward VII who called him a 'scoundrel'. "He was a real troublemaker from the government's point of view and from the Indian point of view he was a liberator. "When I wrote my book on Hardie, I remember having letters from people in India saying he was still an honoured figure." The memorial to Hardie stands at Rhondda Cynon Taf Council's offices in Aberdare.